V8 Original brings extra depth of flavour in this delicious and creamy, vodka-infused Bolognese. For a family-friendly version, just skip the vodka. Rinse the lentils in cold water through a sieve, and then place in a saucepan with 590mls of boiling water. Simmer for 10 to 15 minutes, until the water is absorbed and the lentils are softened but not mushy. Set aside. In a large saucepan, heat the olive oil and add the minced onions. Cook over a medium-high heat for a few minutes until the onions are softened and starting to turn translucent. Add the garlic and herbs and cook until fragrant, stirring frequently to avoid the garlic from sticking to the pan. Be careful not to allow the garlic to turn brown as this means it has started burning. Add the lentils and mix through, followed quickly by the V8 juice and stir through. Bring to a simmer and finally, add the vodka. Simmer for 20-30 minutes while you prepare the courgetti. Create your courgetti by either running your courgettes through a spiraliser or grating with a julienne peeler. Pat with kitchen roll to absorb some of the excess liquid. It will look like too much at this point, but the noodles reduce when you cook them. Once the courgetti is ready to go, add the cream and basil leaves to the Bolognese sauce and continue to simmer while you cook the noodles. In a large wok or frying pan, stir fry the courgetti noodles in olive oil for 2-3 minutes on a high heat. Add salt and pepper to taste. Keeping the temperature in the pan high will soften the noodles while locking in the moisture to stop them from getting too mushy. It it best to do this in small batches to avoid crowding the pan. 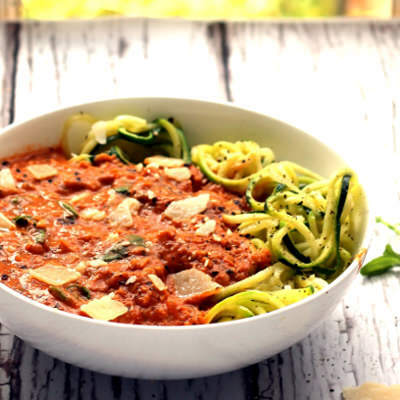 Portion the courgetti noodles into bowls and top with sauce and grated parmesan, if using. Additional nutritional info: Includes Alcohol. Gluten Free. Vegan Alternative Described.